GDP - Gross Domestic Product - is the traditional outcome metric of developmental economics. It is used widely as a benchmark of successful public policy initiatives and as the primary objective of the lending decisions of major global economic institutions. The idea, in a nutshell, is that improvement in per capita GDP is a useful synoptic measure of how well a society is doing. It measures the aggregate of economic activity within a country. More economic activity generated for whatever purpose - building prisons or schools, spending more on health care, whether or not it's medically beneficial - raises GDP. Critics have long argued that GDP is a flawed metric of global development: (a) it fails to capture much of what we want to know about human well-being; (b) it registers as a positive achievement some economic activities that are detrimental to well-being; (c) it measures increases in economic activity that occurs within a nation but it fails to reflect how much of that economic gain stays within that country; and (d) in its emphasis on the maximization of per capita GDP it fails to take into account of the distribution of the economic benefits within that country. In the short film clip to the right, economist Joseph Stigliz offers a summary of some of the central difficulties associated with reliance on GDP as a guide to global development decisions. At one point he mentions the work of the "Commission." He is referring to what is known as the Sarkozy Commission, a panel of economists and social scientists charged with evaluating both the weaknesses of GDP as a measure of economic performance and social progress, and alternative, supplementary measures of human well-being that policy makers should consider. 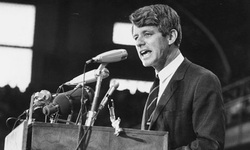 "Our Gross National Product, now, is over $800 billion dollars a year, but that Gross National Product - if we judge the United States of America by that - that Gross National Product counts air pollution and cigarette advertising, and ambulances to clear our highways of carnage. It counts special locks for our doors and the jails for the people who break them. It counts the destruction of the redwood and the loss of our natural wonder in chaotic sprawl. It counts napalm and counts nuclear warheads and armored cars for the police to fight the riots in our cities. It counts Whitman's rifle and Speck's knife, and the television programs which glorify violence in order to sell toys to our children. Yet the gross national product does not allow for the health of our children, the quality of their education or the joy of their play. It does not include the beauty of our poetry or the strength of our marriages, the intelligence of our public debate or the integrity of our public officials. It measures neither our wit nor our courage, neither our wisdom nor our learning, neither our compassion nor our devotion to our country, it measures everything in short, except that which makes life worthwhile." The Sarkozy Commission members include Stiglitz, Amartya Sen, and Jean-Paul Fitoussi. The report contained in their short book, Mismeasuring Our Lives: Why GDP Doesn't Add Up, is one of the very best and most generally accessible works on GDP. The book is divided into three sections. The first part deals with "classical" objections to the reliance on GDP as a measure of how well a society is doing, Objections include its theoretical indifference to the distribution of the fruits of economic growth. Part 2 surveys some familiar supplementary alternatives in use, including the World Bank's Human Development Indicators and various methods designed to capture health-related aspects of well-being. Part 3 discusses a variety of indicators of overall societal well-being - such as "green GDP." These are designed to capture information about both the economic and environmental sustainability of a nation's economic growth. "1) Within a society, rich people tend to be much happier than poor people. 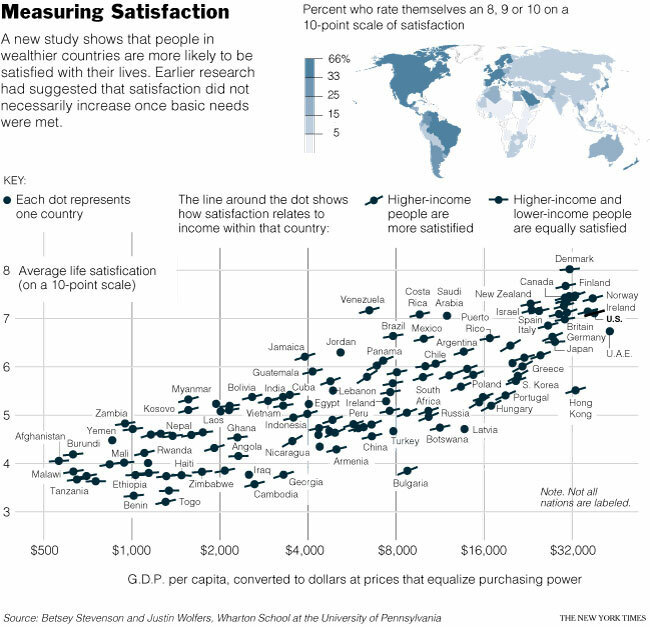 3) As countries get richer, they do not get happier." "1) Rich people are happier than poor people. 3) As countries get richer, they tend to get happier." More Debate on the Easterlin Paradox: Could Both Sides Be Right? "Gallup's global snapshot of wellbeing reveals a vast divide that underscores the diversity of economic development challenges around the world. The percentage who are "thriving" ranges from a high of 82% in Denmark to a low of 1% in Togo. Using data collected in 155 countries or areas since 2005, Gallup classifies respondents as "thriving," "struggling," or "suffering," according to how they rate their current and future lives on a ladder scale based on the Cantril Self-Anchoring Striving Scale. Adults within each of the four major regions are often worlds apart in how they evaluate their lives. Africa has the lowest wellbeing; no country in this region has a thriving percentage higher than 25%. In fact, of the 41 countries where the thriving percentage is 10% or lower, more than half are in Africa." But as critics note, it all depends on how you frame the "happiness question." A 2010 study by Angus Deaton and Daniel Kahneman found that high income improves evaluation of life overall but not emotional well-being. The difference is as follows: "Emotional well-being refers to the emotional quality of an individual's everyday experience—the frequency and intensity of experiences of joy, stress, sadness, anger, and affection that make one's life pleasant or unpleasant. Life evaluation refers to the thoughts that people have about their life when they think about it." A collection of essays on the lively debate over the Easterlin Paradox is found in International Differences in Well-Being, by Ed Diener, Daniel Kahneman, and John Helliwell. For a review of the book and an assessment of its chapters by William Easterly, see his "The Happiness Wars" published in the Lancet in April, 2011. He points out that a standard way of resolving the paradox is to conclude "that it is relative income rather than absolute income that makes you happy... As all incomes rise together, relative incomes don't change and so average happiness does not increase." That would mean that with more consumption, it is often the case that human beings find themselves on a "hedonic treadmill." But there is quite a lot of data that suggests that absolute increases in wealth are positively correlated with improvements in various satisfaction measures. And there is a lot of data to the contrary, including a new multi-country analysis by Easterlin himself. Easterly's conclusion is that all these studies rely on inadequate evidence: "the question won't be settled unless we get much more data (cross-country or longitudinal individual data)." The World Happiness Report for 2012, edited by John Helliwell, Richard Layard and Jeffrey Sachs, ranks nations according to the “Average Cantril Ladder,” a measure of happiness, prepared by the Earth Institute at Columbia University. The report collated data from several different happiness measurement exercises to create a “life evaluation score,” which took into account wealth plus social factors such as political freedom, strong social networks, absence of corruption, and personal criteria including good mental and physical health, someone to count on, job security and having a stable family life. The sources include the Gallup World Poll (GWP), the World Values Survey (WVS), the European Values Survey (EVS), and the European Social Survey (ESS). The United States ranks eleventh. Denmark ranks first. Finland, Norway, Netherlands, Canada, Switzerland, Sweden, New Zealand, Australia, and Ireland round out the top 10. They note for example that the "United States has achieved striking economic and technological progress over the past half century without gains in the self-reported happiness of the citizenry. Instead, uncertainties and anxieties are high, social and economic inequalities have widened considerably, social trust is in decline, and confidence in government is at an all-time low." They speculate that is is for these reasons that life satisfaction has remained nearly constant during decades of rising Gross National Product (GNP) per capita. In addition, the World Bank publishes annual topically themed reports on Human Development. Both of the ones below are available online as well. The WDR 2012 is titled: Gender Equality and Development. The annual Human Development Report tracks 187 countries and territories in the U.N.’s human development index, which is based on composite measurements of health, education and income, and has tracked global living standards since 1990. The health measure is life expectancy at birth, while the educational metric comprehends literacy and primary, secondary and tertiary enrollment rates. Income measures are adjusted to reflect GDP per capita at purchasing power parity with the US (See PPP discussion here). Note also that the HDI has relied on average income levels and thus historically has not taken into account the distribution within countries. For the first time in 2010, the report complied an HDI index adjusted for income inequality. So in two countries with the same fairly high HDI one might have half the population in poverty while the other half does really well, and in the second country, almost all fare more or less at the same middle range level. The new inequality measurement matters greatly. For example, the United States ranked fourth overall in the 2010 development index. But when the rankings were adjusted for “internal inequalities,” the United States fell to 23rd, from 13th last year, mainly because of inequalities in income and health care. Life expectancy is one of the major ways we assess quality of life. It's also one the main forms of inequality across the globe. The World Health Organization published its massive Global Burden of Disease Study 2010, in December of 2012. The Executive summary summarizes the findings for 187 countries in 7 articles published in the Lancet. The Study represents a systematic effort to describe the global distribution and causes of a wide array of major diseases, injuries, and health risk factors. Infectious diseases, maternal and child illness, and malnutrition now cause fewer deaths and less illness than they did twenty years ago. These are the diseases that have contributed most to reduced life expectancy at birth, and so life expectancy at birth has been rising primarily due to the fact that more people survive the first few years of life. For example, the WHO Study noted that infant mortality declined by more than half from 1990 to 2010, and malnutrition, which was the the number 1 risk factor for premature death, fell to No. 8. For an up-to-date survey of life expectancy at birth covering 222 countries and territories, see the most recent CIA Factbook, itself an amazing reference for county-by-country comparative data of all sorts. Some of the data might surprise you. For example, the US is ranked 51st. Chad comes in a 222 with a life expectancy of 48.69 years and Monaco ranks 1st at 89.68. One of the strongest correlations with reduced life expectancy is extreme inequalities in the distribution of resources, in both income and wealth among individuals, but also inequality in public expenditures on public health and education. An important measure of well-being can be found in efforts to assess the global burden of disease. According to the World Health Organization, "Global Burden of Disease analysis provides a comprehensive and comparable assessment of mortality and loss of health due to diseases, injuries and risk factors for all regions of the world. The overall burden of disease is assessed using the disability-adjusted life year (DALY), a time-based measure that combines years of life lost due to premature mortality and years of life lost due to time lived in states of less than full health." Reduced life expectancy then is one concern, disability or other health impairments that do not necessarily reduce length of life are another, and the combined index is meant to capture both. The DALY approach has its critics, in part because of doubts about the informativeness of various aggregate health measures, and in part, criticisms are based on their use as part of economic priority setting criteria that ultimately attempt to minimize DALY loss using interventions that have the most favorable benefit-cost ratios. Objections of those sorts aside, DALYs can provide some very useful information when combined with efforts to identify the major contributors to premature death and preventable disability. So in addition to the reduction in early childhood causes of death, we know that non-communicable diseases, such as cancer and heart disease, have become the dominant causes of death and disability worldwide. There are many contributing causes to these increases, including a variety of lifestyle factors. The World Health Organization in 2006 estimated that 24% of the global disease burden and that 23% of all deaths can be attributed to environmental factors,. Note that the estimate of environmental causes is meant to be a category that excludes the various lifestyle or cultural and behavioral causes such as smoking and diet. The intention of the research methodology is to avoid an overly expansive definition of what counts as 'environmental'. (Prüss-Üstün and Corvalán 2006). See the report, Prüss-Üstün A, Corvalán C. 2006. Preventing disease through healthy environments. Towards an estimate of the environmental burden of disease. World Health Organization. Amartya Sen's contributions to both economics and political philosophy are difficult to overstate. He gained prominence and ultimately a Nobel Prize in economics for early work on the causes of famine showed that it was not absolute scarcity but political institutions dealing with distribution. Moreover, his analysis also informs his critique of GDP as a measure of a nation's well-being includes the fact that it fails to reflect not only domestic variations in economic distribution, but also intra-family differences in the distribution of resources most affecting well-being. The upshot is that international development agencies should be capturing directly indicators of well-being rather than relying exclusively on distribution-insensitive, aggregate economic proxy measures such as GDP. What matters in terms of well-being, on Sen's view, is not resources or aggregate GDP increases but human capabilities - or what "individuals can do and be." The capabilities approach presents an alternative to both development economic theory and practice and to philosophical theories of social justice that also focus on fair distributions of key resources. Adequate theories of justice as well should aim for enhanced functional capabilities of various sorts. It matters as well that such theories capture separately the various dimensions of functional capability, such as health, educational attainment, and other marks of a decent human life. His work has influenced many policy makers and can be seen as a major part of the impetus behind the creation of human development indicators now used by the World Bank. There are many books by Sen that might be recommended. My own view is that his theory is best presented in its most interesting and illuminating detail in two of his books, Development as Freedom and Inequality Reexamined. See also the work of Martha Nussbaum, especially her Women and Human Development. My colleague and I argue in chapter 2 for a multi-dimensional account of well-being that should be the proper outcome metric of a theory of both domestic and global justice. Six core elements are claimed to be the central concerns of domestic political institutions and should guide international development policies and institutions and relations among nation-states. The core dimensions include health, reasoning or cognition, personal security, personal attachments, self-determination, and the respect of others. We argue also that justice does not necessarily require equality in human well-being but a sufficient level of each core element. That said, for some particular dimensions nothing less than equality can be judged as sufficient. Moreover, our account of human well-being is an outcome-oriented theory in much the same way many leading theories of human rights are similarly cast. The aim, for example, is not that each person have the opportunity for leading a self-determining life - or as the capabilities approach argues, have the capability to do so if so choosen - but to be self-determining. Each core element is thus a matter of separate moral salience by which the justice of nations, social practices, and global institutions and patterns of international interaction should be judged whenever any of these institutions or practices exert a profound and pervasive impact on the core elements that significantly determine whether individuals live decent human lives. The aim of a sufficiency of well-being across all dimensions is one of two central aims found within our Twin Aim Theory of Justice. The other aim involves the prevention, mitigation, or elimination of densely woven patterns of systematic disadvantage that pose severe impediments to the ability of individuals and groups to lead decent human lives. For more, see, The Twin Aim Theory. A trend in the developmental economics further illuminates how we see the importance of recognizing significant causal linkages between dimensions of well-being. While the genesis of our theory lies in a concern for social justice, and much of the social science literature that informs our own approach is drawn from studies of deprivation and disadvantage within single societies, there is a practical analogue that bears directly on our rationale for explicit extension of our theory to problems of global justice found within recently devised measures of poverty used by developmental economists. An example is the multidimensional poverty index (MPI) developed in 2010 by Sabina Alkire, James Foster, and colleagues from the Oxford Poverty and Human Development Initiative (Alkire, Sabina, and Sumner, Andy 2013. 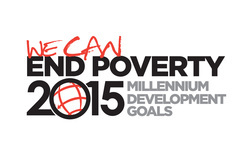 “Multidimensional Poverty and the Post-2015 MDGs,” with Development 56(1) 46-51). They argue that poverty, or more precisely deprivation, is better understood when standard household income measures are replaced by an index designed to capture what they aptly describe as the multidimensionality of poverty. The purpose of the MPI is to understand the nature, number, and geographic location of deprivations experienced by those who are multidimensionally poor. They proceed by devising a list of indicators that reveal “deprivations in core functioning” and “rudimentary services.” Core functioning deprivations are measured by indicators of health such as child mortality and nutrition, and measures of education such as total years of schooling and percent of children enrolled. Rudimentary service indicators include living standards such as access to water, electricity, cooking fuel, and toilet facilities. The core functionings identified by the MPI and our list of core dimensions are generated for somewhat different purposes. In our case, it is for the purpose of developing of a theory of social justice that tracks a fairly comprehensive list of morally salient forms of deprivations that might be overlooked by political philosophers. The purpose of the MPI is a better understanding of the complexity of poverty and the ways in which the nature and impact of a few key types of deprivations are easily overlooked by economists and policy makers. However, there are two points of significant agreement. First, the creators of the MPI and we start from the assumption that there are distinctly salient dimensions of deprivation that should be highlighted, and in fact some of the same dimensions figure in both approaches. Ours is more inclusive for the sake of capturing elements we take to be on a moral par in evaluating whether social arrangements are just. Theirs is less inclusive for the sake of focusing on a few key variables for which there is ample cross-national data. Second, both approaches assume that an important part of the rationale for the choice of the core dimensions in the respective theories is the role each plays, not only as a dimension of distinct theoretical salience, but each is a dimension that is crucial to capture also because it has significant impact on other core dimensions of well-being, and ultimately, significant impact on the realization of well-being that is specific to personal conceptions of a worthwhile life for particular persons.